Do you hate dragging out a heavy sewing machine just to do a 5-minute repair job? This electric hand-held sewing machine is excellent for on-the-spot repairs and small enough to fit in the palm of your hand. It can out-perform any conventional desktop sewing machine and will make your stitching experience flawless. You can carry Insta-Stitch™ in your bag while traveling and stitch like experts anytime. Anyone working with curtains, interior decoration or sewing her or his own clothes will enjoy using this time-saving device. Handheld and light weight: Insta-Stitch™ is perfect for on-the-spot repairs and quick alternations. Whether it is fixing a seam, quickly repairing the curtain or sewing a pocket, it meets various sewing requirements without any hassle. Portable and compact Design: This cordless sewing machine is easy to carry for travel and household use. Now, you don’t have to make an extra effort for day to day alternations. Easily repair clothes, create DIY crafts or sew hanging curtains, hassle free. Dual Powered: Simply use 4 xAA batteries (not included) or DC 6V Power Adapter(not included) for easy and effortless stitching. You can use it at home, car or office, whenever you need instant sewing or stitching. Insta-Stitch™ offers neat and straight stitch, providing you the perfect finishing. Perfect for all Fabrics: It works great on fabric, clothing, silk, jeans, leather, denim, wool, drapes, holes/rips etc. Easily make some DIY handkerchief, cloth toys, patchwork, simple embroidery or arts crafts with Insta-Stitch™. 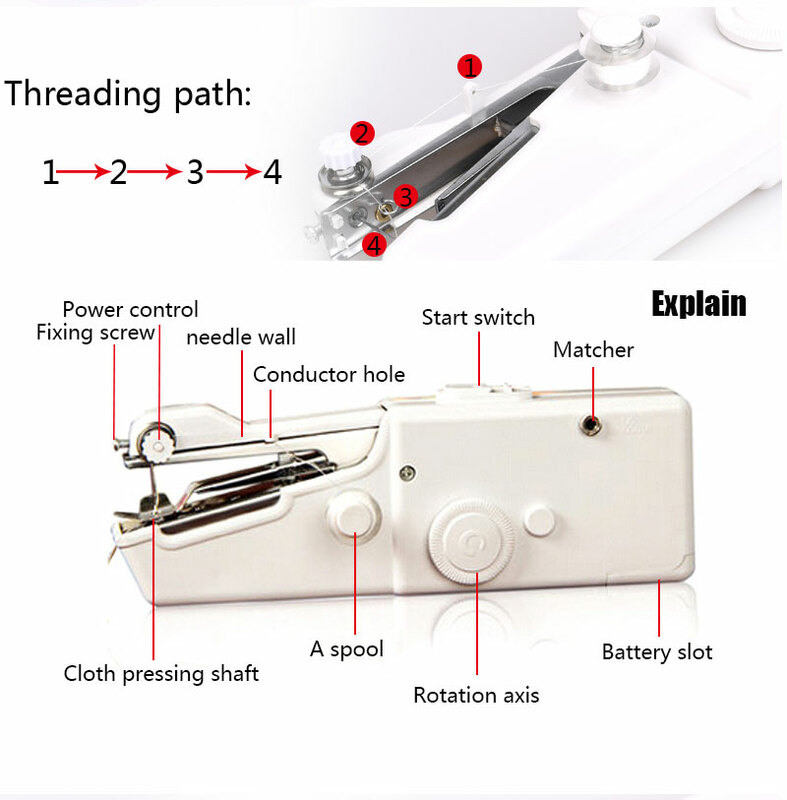 It is a single side stitch machine and can easily sew up to thickness 1.8mm. Easy to use: Insta-Stitch™ precisely controls stitching with the rotary wheel adjustment and it has tension control to adjust the tightness of stitches, the fastening plate holds the fabric while stitching; making your work more efficient. The first step in using the Insta-Stitch™ is to load the four AA batteries. The batteries go in the compartment on the bottom. After loading the batteries, the sewer should set up the bobbin and thread the machine.